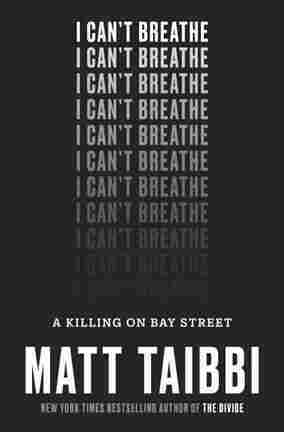 'I Can't Breathe' Examines Modern Policing And The Life And Death Of Eric Garner "The reality is that Eric Garner died at the hands of a police force and a criminal justice system that were designed entirely by white people, for the most part," says journalist Matt Taibbi. 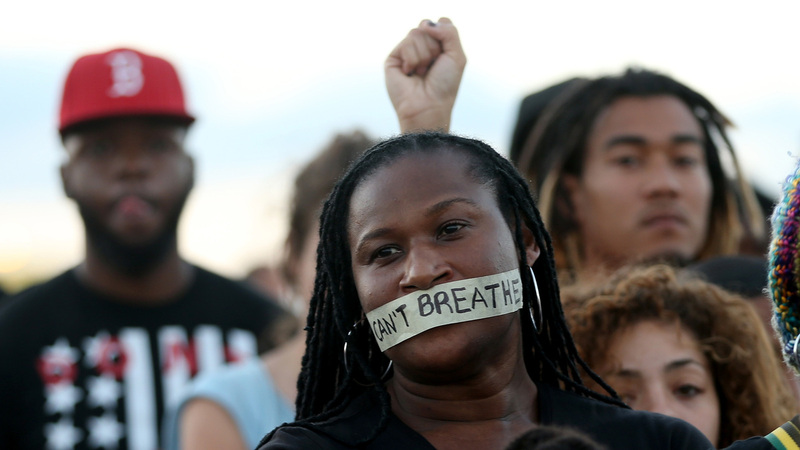 Demonstrators in Miami stand with tape reading, " I Can't Breathe," in 2014. The protest occurred after a grand jury in New York City declined to indict the police officers involved Eric Garner's death. On July 17, 2014, an unarmed black man named Eric Garner died on Staten Island, N.Y., after police officers threw him to the ground and put him in a choke hold. Garner's last words, as recorded on a cellphone video, were: "I can't breathe." He repeated the phrase 11 times. Although the coroner's report listed the cause of Garner's death as "homicide," no police officer has been charged in the case. But the video of Garner's last moments helped bring national attention to the injustice black Americans face at the hands of police. "That tape had a huge impact on everything," says journalist Matt Taibbi. "It's opened the eyes — particularly of white Americans, who may not have believed that this kind of thing goes on." In his new book, I Can't Breathe, Taibbi writes about Garner's life, the police practices that contributed to his death and the rise of the Black Lives Matter movement. Taibbi, who is white, initially wondered whether he was the right person to tell Garner's story. But as he dove deeper into the root causes of Garner's death, he began to feel differently. "I think it's important for white reporters, ultimately, to own some of the responsibility for telling these stories, because it's our story, too, in a kind of terrible way," Taibbi says. "The reality is that Eric Garner died at the hands of a police force and a criminal justice system that were designed entirely by white people, for the most part." He was complex, funny, larger-than-life, flawed. He was the kind of character that people talk about in the street. Everybody has a story about Garner. They're all funny. One of the first things I heard about him is he used to buy whole pizzas and fold them in half and eat them like tacos. But he was also, in contrast to the way that he's described in the news — where he's usually depicted as a small-time "loosie" cigarette dealer — he actually was a pretty decent businessman. He was running kind of a tight crew there where he had a bunch of people working for him, so he was successful at that in a sense. He was, on the other hand, a complete failure as a drug dealer, which was his prior occupation. He was just a complex person. He didn't want to be out there doing what he was doing, but he had kids and he had to feed them and late in life this just became a way for him to get by. He put all his money toward his family. He was just an interesting person. He had many facets to his personality. [Eric Garner] would never have been in this situation where he was being constantly pursued by the police if there were not expensive real estate developments across the street. He would never have been in this situation where he was being constantly pursued by the police if there were not expensive real estate developments across the street. He was exactly the kind of person that they were trying to get rid of in order to make this more expensive real estate. Fights [in that area] happen fairly regularly, but Garner, one of his roles in that neighborhood was to break up fights, because fights attracted police. He used to say he tried to "keep the block from getting hot," that was his expression. So he broke up this fight between these two characters, and as soon as he was done doing that he went up and leaned up against the wall to catch his breath, and it was that exact moment that he was approached by police. And that's part of the dynamic that you see on the tape. He's flabbergasted because he can't believe that they're arresting him at a moment when he wasn't actually doing anything. That's a huge component of this story, and a big reason why he wouldn't go when they asked him to get into the squad car. He just felt like, "How can you arrest me now when I wasn't doing anything?" This is a perfect metaphor for everything that's wrong with the modern policing strategies, the things that we call "broken windows" policing, which heavily emphasizes targeting minor offenders. The whole theory of modern policing in most big cities in America is if you go after the little things — people jumping turnstiles, ... urinating in public, selling [single cigarettes called] "loosies," doing the little things — then people will be discouraged from walking out of their homes in the morning carrying a gun or with the intent to commit a more serious crime. So the whole theory is, "Let's stop thousands and thousands of people over the course of every year, arrest people for every minor, trivial violation, and eventually serious crime will decrease along with minor crime." But the problem is the heavy emphasis on minor crime leads to a lot of violent incidents that are unnecessary, on the one hand, and, on the other hand, you see a lot of real serious crimes that are ignored. And this is a perfect example of that, where you had a fight where you could've easily arrested the people who were involved in that, but they ignored that in favor of Eric Garner who was just somebody who had been seen by another police officer standing on a corner a couple of hours previously. [Officer Pantaleo is] still on the payroll of the New York City Police Department. There were reports last year that he had actually received overtime in the year that he was on desk duty. So he's still being paid. He's still getting benefits. He's still able to go to a doctor or a psychiatrist on the public dime if he wants to. And he's still an employee of the NYPD. There is an internal disciplinary proceeding that is going on against him, but that has to wait until the federal civil rights case plays out one way or the other. We won't know if he will be dismissed or docked vacation days or fined or anything like that until after that case is over. Sam Briger and Mooj Zadie produced and edited the audio of this interview. Bridget Bentz, Molly Seavy-Nesper and Tanya Ballard Brown adapted it for the Web.